Last December we went to Disney World over Christmas Break. I created some cute custom luggage tags that I totally forgot to show you guys. Better late then never, right? 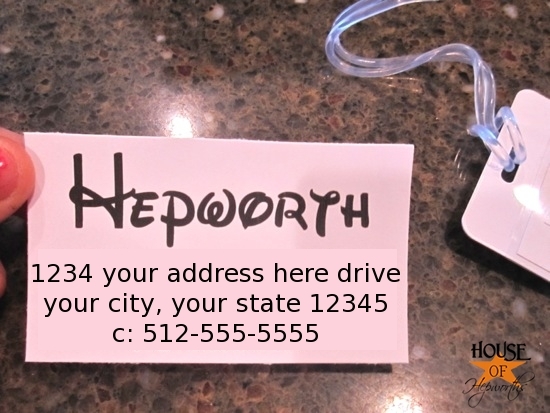 Another fun little detail that I easily made were custom “Disney Font” luggage tags. 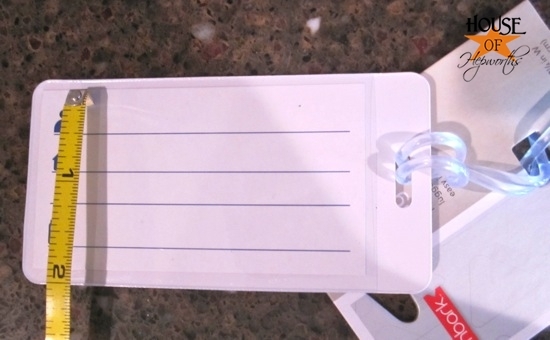 These were super easy to make, and all you need are luggage tags and a printer. 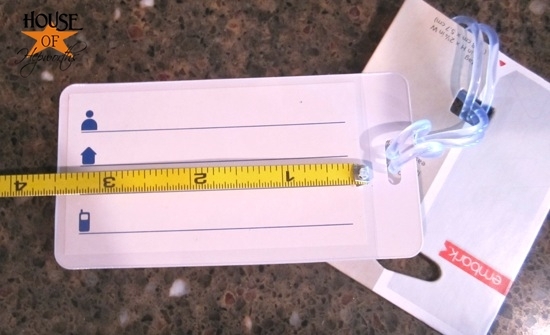 Start with luggage tags. I bought these at Target. 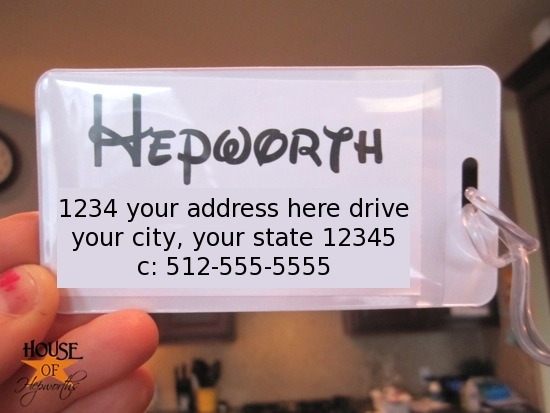 Instead of just chicken-scratching our info on the address card that came with the tags, I decided to print some up in a fun Disney Font. I used the free Disney font for our last name, and then a very basic plain font for our address. To get the exact size labels needed, just measure the height and width of the tag area and using your writing program (ex: Microsoft Word) create your text the same size. 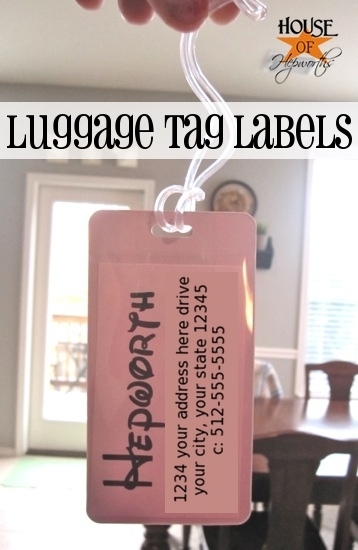 I printed my address labels on cardstock then cut them out and slid them into the luggage tag. The added touch of the Disney font luggage tags made the trip that much more exciting for the kiddos. And now, just for fun, do you have any crafts or creative projects you’ve made for a trip to Disney World or Disney Land? Link up your old Disney posts and share your projects with everyone! I’ll leave this party open for two weeks (until November 26th). I followed Silhouette on FB! Oh I adore the font! Suggestion: omit home address and only list your cell – but only if your cell can not be traced to your residence via google or whitepages.com, etc. Oh wow. You guys were cool! We went for Christmas last year with my husbands extended family and my inlaws had all of us wear matching red Micky Mouse hoodies. They weren’t ugly or bad at all, I just don’t like themed or matching outfits. Love those tags! We drove to Disneyland this summer, so didn’t need suitcases w/ labels, but if we ever do, you know they’re gonna be cute! As a 15-year employee of “the frendly skies” who worked in baggage service, I feel obligated to reiterate that people shouldn’t and don’t need to put home addresses on your luggage tags. It’s an announcement that you are out of town. Putting a cell number on your luggage tag is a good idea. My husband does slide his business card into his luggage tag, but it has only his cell number and work number and no way to trace his bag to our house. He works in a big office and if his bag were lost, he would have the airline return it to his business address. Many people will put their personal identifying information on a card inside their bag. Sometimes opening a bag is the last choice and the only way to find identifying info, if the tag falls off the outside of the bag. Yikes! I just had no idea! I thought we were suppose to put our address on it. Never again! Next time I’ll put my last name and our cell number. Thanks for the heads up!! P.S. Adorable tags and fonts, Allison. Not only did I work 15 years for an airline, I worked 11 years at Disneyland (when there was no Resort or California Adventure). P.S. If your luggage is lost, they will ask for the delivery address on the form you fill out at the baggage service counter when you report the bag lost, so they do have a way to return your luggage to you. Great idea for a linky party! 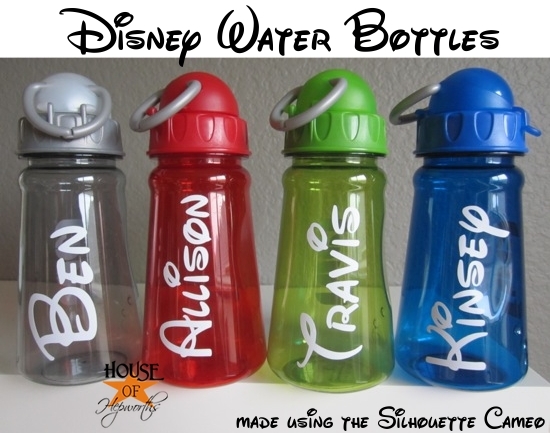 Where do I find the Disney font? 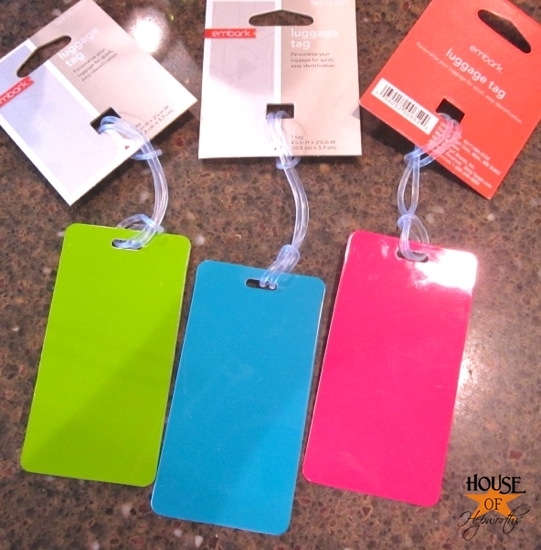 I am trying to make luggage tags similar to these. I found some sites but I couldn’t figure out to get them. 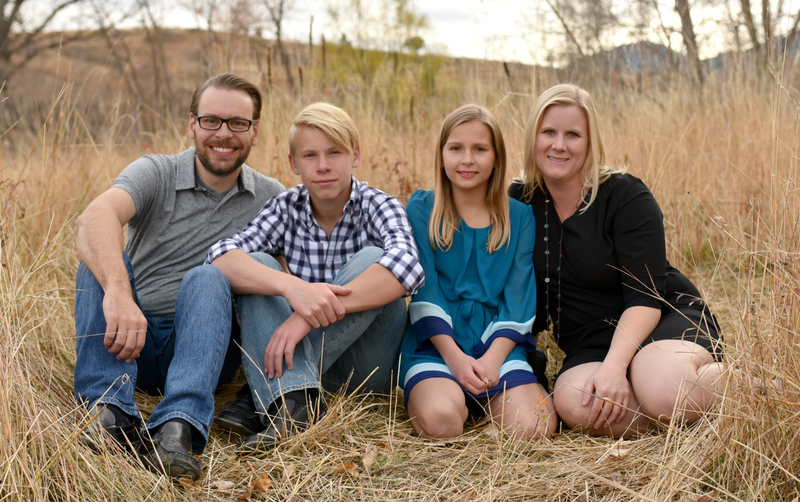 Help please…by the way I love your site! !